Mickey Mouse is a funny animal cartoon character and the official mascot of the Walt Disney company. He was created by Walt Disney and Ub Iwerks at the Walt Disney Studios in 1928. Mickey Mouse was created as a replacement for Oswald the Lucky Rabbit. Mickey first was seen in a single test screening. Mickey officially debuted in the short film Steamboat Willie (1928), one of the first sound cartoons. He went on to appear in over 130 films, including The Band Concert (1935), Brave Little Tailor (1938), and Fantasia (1940). Mickey appeared primarily in short films, but also occasionally in feature-length films. Nine of Mickey’s cartoons were nominated for the Academy Award for Best Animated Short Film, one of which, Lend a Paw, won the award in 1942. In 1978, Mickey became the first cartoon character to have a star on the Hollywood Walk of Fame. Beginning in 1930, Mickey has also been featured extensively as a comic strip character. 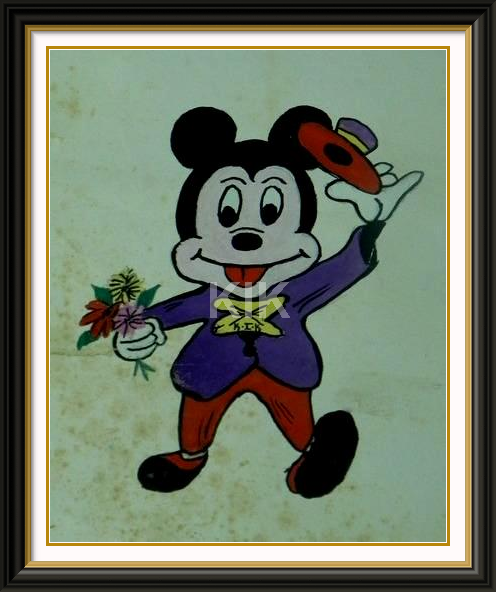 Mickey has also appeared in comic books and in television series such as The Mickey Mouse Club (1955–1996) and others. He also appears in other media such as video games as well as merchandising, and is a meetable character at the Disney parks. In 2009, Disney began to rebrand the character again by putting less emphasis on his pleasant, cheerful side and reintroducing the more mischievous and adventurous sides of his personality, beginning with the video game Epic Mickey. painted this in the year 2000, that is 13 years back.